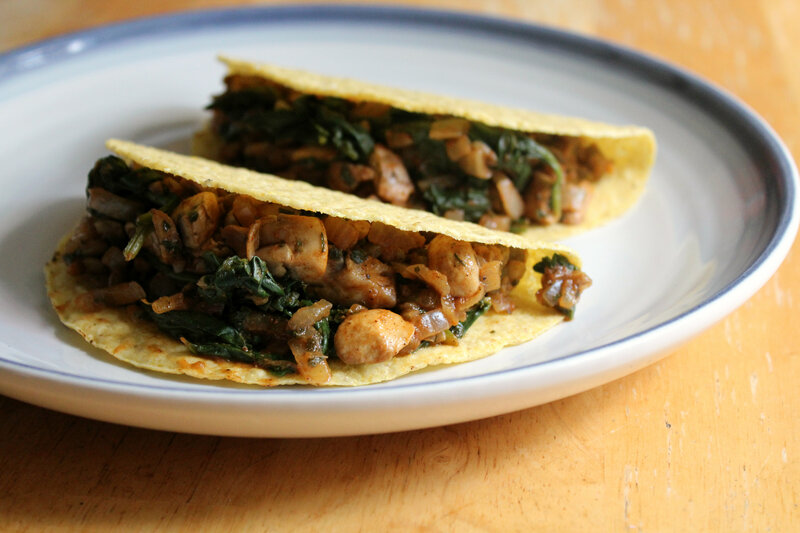 An easy weeknight dinner recipe to satisfy your taco crazy in a healthy way! Gluten-Free and vegan Lentil Veggie Tacos are a great plant-based meal that will leave your feeling satisfied with the protein power of lentils! Looking for a quick and easy taco recipe you can whip up in a flash? 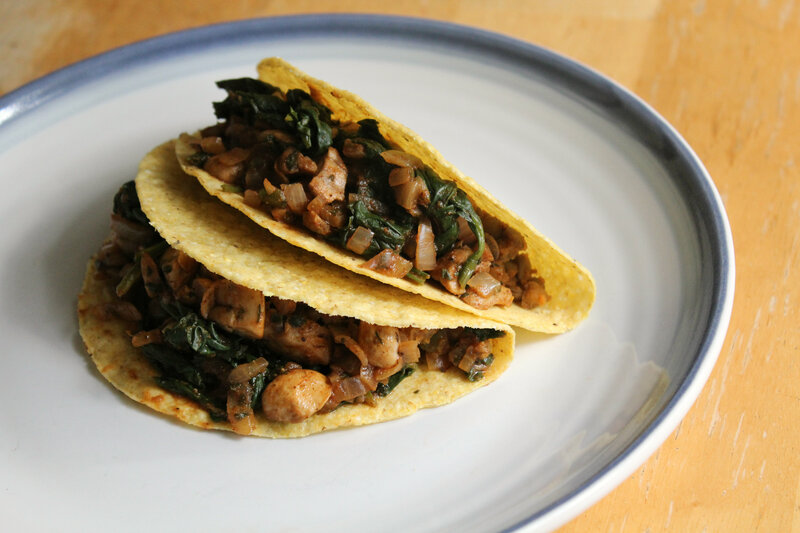 Why not some delicious Lentil Veggie Tacos! Plant-based protein and loaded with healthy veggies, you’ll be left feeling satisfied and energized! Begin to cook the lentils according to package directions. After the lentils have been cooking for 15 minutes, mash them and add the prepped veggies and spices. Cook the lentils and veggies together for the remainder of the cooking time or until all water is absorbed. For the tortillas, warm in a preheated oven at 450°F for about 10 minutes. To serve, spoon on the lentil veggie mixture to your liking and enjoy! Top however you’d like! Some guacamole, salsa, hot sauce, or vegan sour cream! + What’s one of your favorite taco fillings? 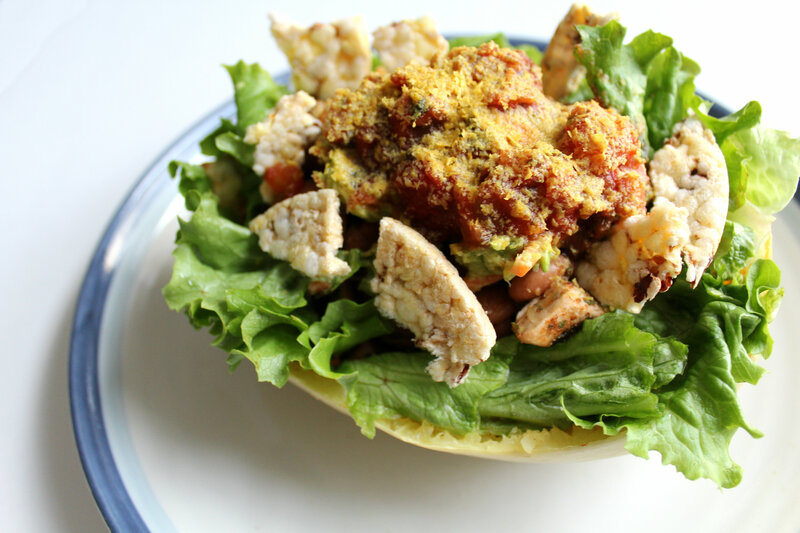 When I think of avocados, I always think of Paleo people (haha) and Mexican dishes! 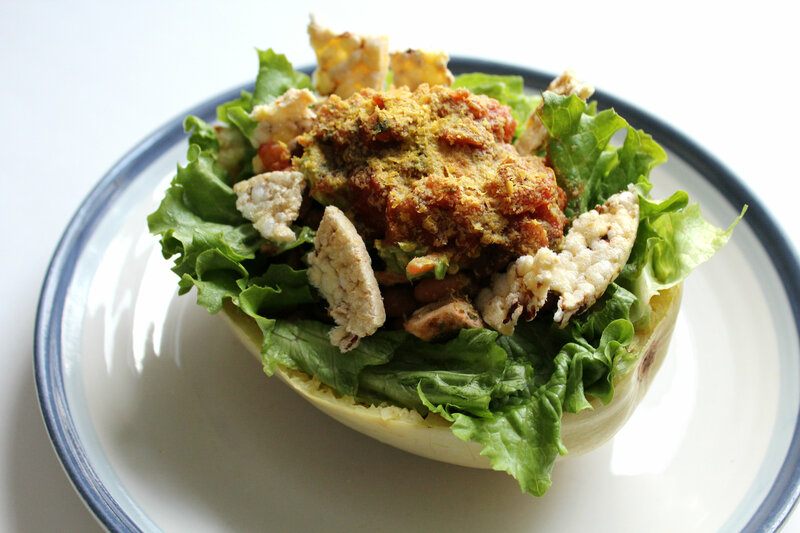 Since I will never jump on the Paleo wagon, but I do like Mexican dishes…avocado and Mexican it is! I whipped up this dish a few weeks ago because I was craving beans, salsa, and avocado. Maybe it is all those Chipotle bowls everyone always posts and raves about. Well I won’t eat “fast-food” or eat out so I made my own Mexican bowl. Plus, I said “screw the acid reflux” and bought my first bottle of Cholula Hot Sauce at the grocery. 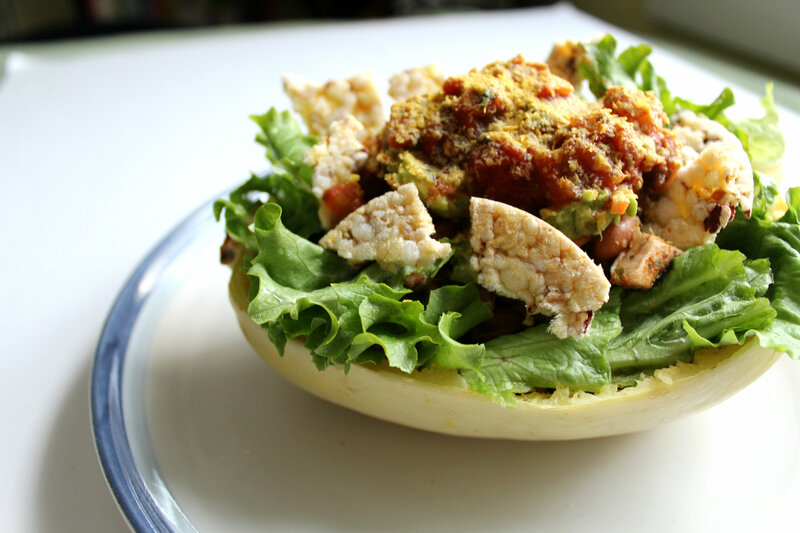 What better way to try it out then with a Mexican dinner bowl? And one more thing. You don’t even need to dirty a bowl for this “dinner-bowl!” I was very resourceful and used my scrapped out spaghetti squash halves as the serving vessels! Perfect, right?! + For the Squash: Cut the squash in half lengthwise, scoop out the seeds and inner strings, then pop each half in the microwave for about 5 minutes. When each half is done and fork tender, scrap out the squash and transfer to a bowl. + For the Beans: In a medium sauce pot, pour in the beans (rinse them under water first) and add the mushrooms (chopped). Then add all the spices plus 2 TB of water. Simmer on low for about 5 minutes until warm. + For the Avocado Mash: Cut your avocado lengthwise and scoop out the good stuff into a bowl. Then chop your celery and add that to the bowl along with the shredded carrots. Then add the additional spices. + Now it is time to assemble. In each empty squash half, add about 1 cup of squash, 1 cup of beans, 1/4 cup of avocado mash, then your additional toppings. 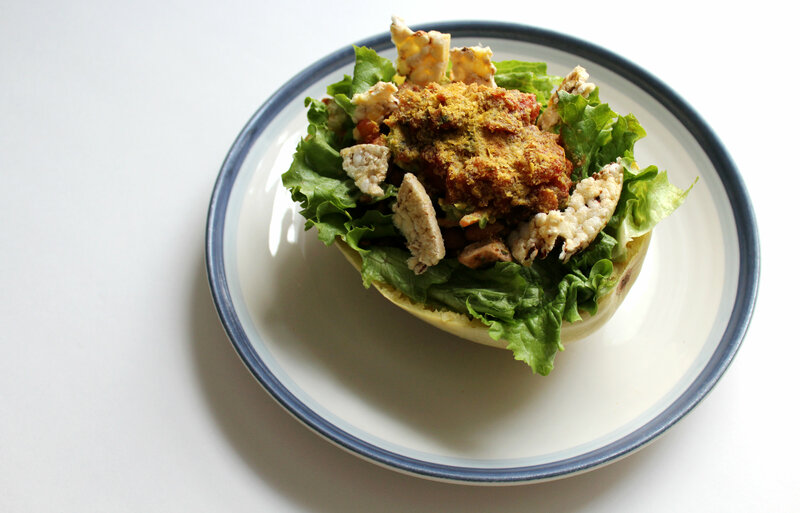 I used a few tablespoons of salsa, a handful of crunchy lettuce stuffed into the sides of the bowl, 1 TB of nutritional yeast, a few dashes of hot sauce, and two crumbled corn thins. Are you an obsessed with Chipotle like so many bloggers seem to be? Not only have I been craving Pumpkin, Apples, Cinnamon, and Roasted Everything, but I have also been craving/needing something that is warm, comforting, and that you can eat with a spoon in a bowl, for days on end. That’s when I realized I needed some chili in my life ASAP. After a long day of freezing in school (I am telling you the classrooms are like 40 degrees and then some kid comes strolling in, declares they are so hot, opens all the windows and turns the fans on. I can’t take it. I have to learn in the Arctic). So when I get home I want something that will warm me up for dinner, get the chill out of my bones. So I made a huge pot of Veggie Bean Chili to savor and enjoy over the week. And you know what? It did the trick. Comfort in a bowl. 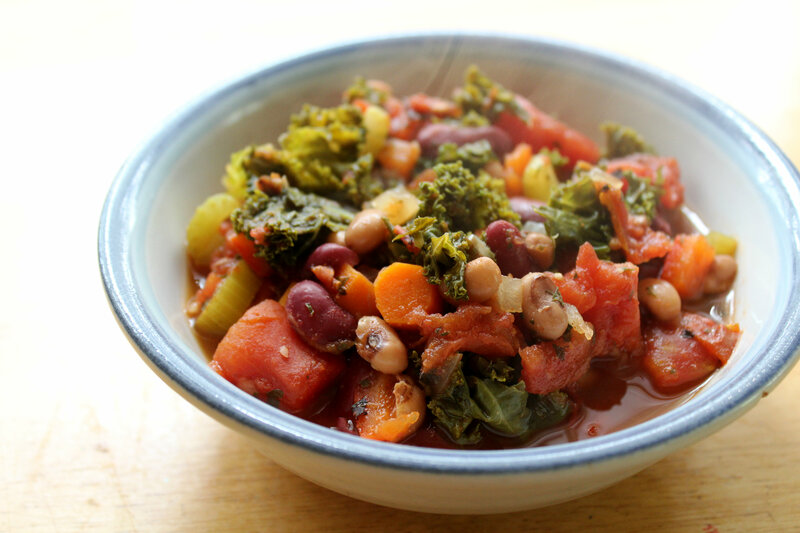 Slightly spicy, full of veggies and two types of beans. I added some crunch my eating mine with some left over corn tortillas form my Savory Pumpkin Lentil Tacos! Making chili, soup, or a stew isn’t just about a great warming meal. I always feel a little nostalgic when I make a big pot of soup. It always bring me back to the first time I ever cooked anything, which happened to be soup. I was probably like 6 or 7, I don’t remember the exact age, but I was young. It was the weekend so my dad was home and we started looking through some old recipes we found in the kitchen for something to make for dinner. But then we decided to just wing it and go to the grocery to pick up ingredients for a soup. We ended up buying a huge mish-mosh of every veggie you could possibly think of for a wonderful vegetable soup. (I am so made that I never wrote the list of ingredients done…) Even though we just through everything together it came out lovely. Family + Love + Veggies + Hot Soup = Amazing. From that day and that soup forward I would always bug my dad to cook with me, until I began cooking completely on my own. That day I learned of my love of cooking and have never looked back since! With cooking, especially soups, you can never get it wrong. It is a time for creativity and invention and a way to bring out your true personality through the flavors you create. + Bring 1 1/2 cup of water to a boil, rinse the lentils and add to the pot. Boil for 3 minutes then reduce heat to low. Cook for 20 minutes, covered. When the water is mostly gone and lentils seem cooked, add the pumpkin and mix. Make sure the heat is now on simmer, you may need to ad an extra TB of water at this point. Mix around and simmer uncovered for 5 minutes, then remove from heat. + In the mean time (while the lentils are cooking), chop dice the onion, chop the mushrooms, and add all the spices into a bowl and toss. Zest the lime and add to the mix as well. + Place a large saute pan on medium heat and let it heat for a few minutes. Then add your bowl of veggies. Dry saute for about 3 minutes on low, stirring constantly. Then add the spinach and juice the lime directly into the pan (this will allow the spices to be scraped off the bottom and get incorporated better). Stir around and saute for 2 to 3 more minutes. Remove from heat. + Now it is time to assemble! 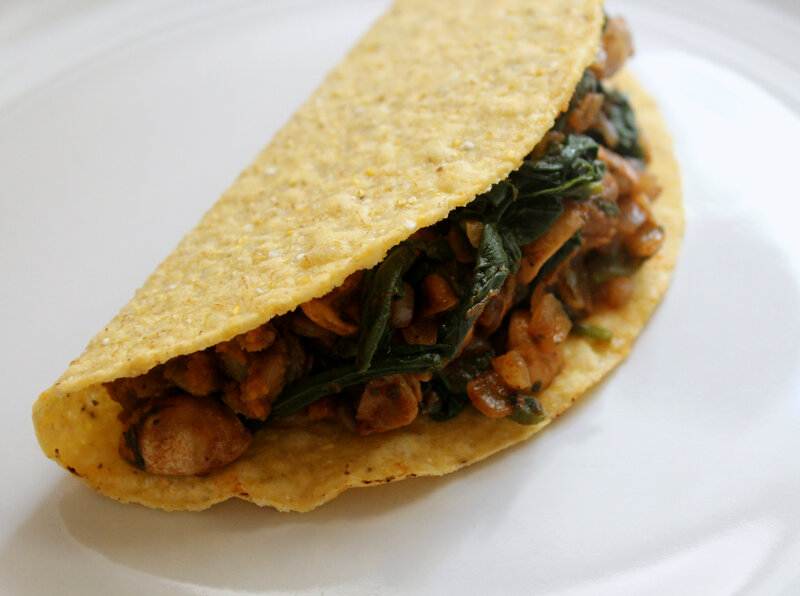 Take a taco shell, spoon in some of the lentil mixture, then top with the mushroom saute. That’s it, Enjoy! After I finished cooking these babies up, I was a bad blogger and just dug right in. I could not delay eating them any longer and didn’t feel like taking my camera out for pictures. But thankfully I had leftovers for my self the next. Thus the photo shoot took place then. I do not get how bloggers take photos while they are cooking either. Like my hands are messy and I can’t touch my camera, I am rushing to get things in the pan, after I touch my camera I don’t want to touch the food until I wash my hands, and it just dons;t work out. Then when I am done cooking, I am usually starving and do not want to eat cold food, so taking pictures is such a hassle. I guess that;s why I am not an official food/ recipe blogger. I don’t do multiple recipe trials and development. I just cook the recipe in my head and eat…then sometimes remember to take pictures for the blog post that day. I have however been getting into the habit of actually writing down the ingredients and what I do while I am cooking so I can remember and give you accurate measurements! And remember its WIAW! Link up with Jen’s beautiful blog! 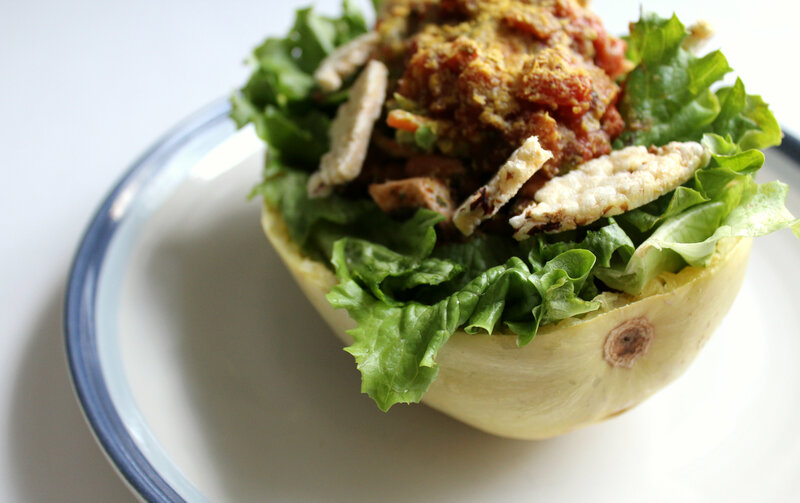 My recipe is also shared and featured on Healthy Vegan Friday! What is your favorite savory pumpkin recipe? Link up in the comments! Do you like Mexican food? O how I wish I could eat endless quantities of tomatoes, peppers, salsa, and spiciness.